Core instructional practices in many secondary classrooms are not strong enough to meet rigorous needs for 21st century society and workplace, especially in critical thinking and conceptual learning. Schools typically lack integrated, tiered, effective secondary instructional interventions to tailor classroom teaching to each student’s unique learning challenges and gifts. In reviewing evidence and research from across the country, as well as pilot projects and examples of implementation in our own region, we determined that the best body of practice to address these needs came from The University of Kansas – a body of practice coming from almost 3 decades of research called Strategic Instruction Model – SIM. 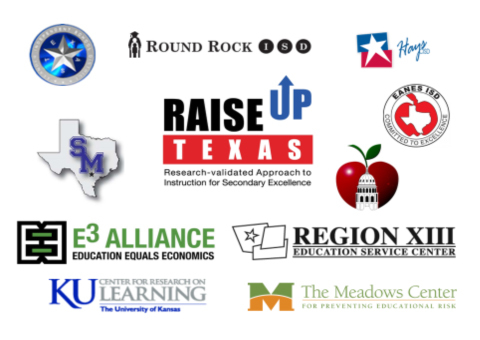 RAISEup Texas was originally designed as a federal Investing in Innovation (i3) grant proposal to transform middle school teaching and learning across the region based on implementing SIM as a whole-school reform model. 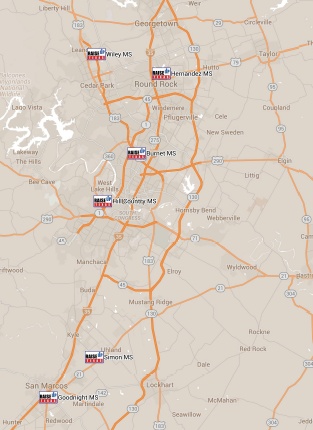 While in the top 5% of all 1,698 applications submitted, RAISEup Texas was not funded. However, every partner in the collaborative committed to moving this project forward regardless, so in January, 2011 a collaborative of six partnering school districts, ESC Region13, the UT Meadows Center for Preventing Educational Risk, and The University of Kansas Center for Research on Learning, led by E3 Alliance, launched a regional effort to transform middle school teaching and learning: RAISEup Texas (Research-validated Approach to Instruction for Secondary Excellence). This privately-funded 3 ½ year demonstration effort provided “wall to wall” transformation of the teaching and learning process, serving almost 13,000 students and providing demonstration sites in six school districts representing over 180,000 total students.